Up to 30 people gathered recently in Rossmore Park to hear Felim MacGabhann speak about the wild and edible plants of the park, on a walk organised by Monaghan Ecological Group (MEG). The walk was well attended and extremely informative and enjoyable despite the poor weather. MEG member Mícheál Callaghan reflects on the walk and related issues. Click here to see more pictures from this event. The aim of the walk was to highlight the various uses of the wild plants growing in our woodlands and our roadsides. We often take for granted or simply do not realise the variety and many uses of many uses to which they can be put. For example, the dandelion can be used to treat bruises and wounds and a coffee can be made from its root. Clover, which grows readily in Ireland, is the source of many vitamins, including vitamin C and a tea can be made from its flowers. The bulb of garlic can be rubbed on wounds and insect bites. 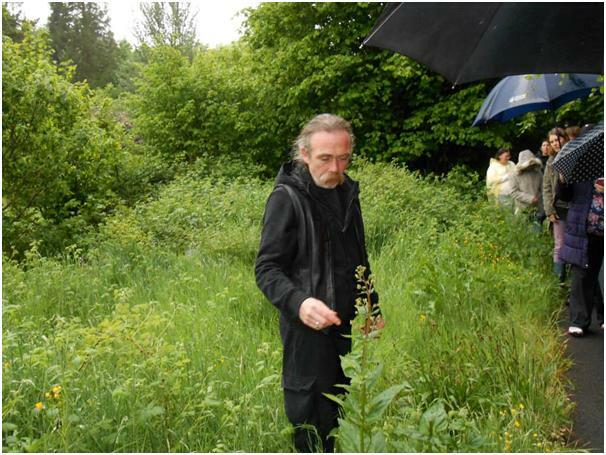 Felim MacGabhann spoke with authority, passion and ease about the various plants in Rossmore Park and impressed those attending with his knowledge of wild plants. We live in a world where more information than ever is at our fingertips with the widespread availability of the internet and the rise of smartphones. If we are ill or have a medical condition we simply go to the pharmacy or supermarket and pick up some tablets without thinking about their origin or how they were manufactured. We may not realise that these pharmaceuticals, most of which are the subject of patents, replicate the chemical formulae and uses of wild plants, which were used for thousands of years to treat conditions and illnesses. It is also worth bearing in mind that modern, mass produced pharmaceuticals rely heavily on the availability of oil for their manufacture and their transportation. It would be a both a pity and a risk simply to dismiss the uses and benefits of wild plants and herbal remedies given the fact we live on a planet of finite resources. While pharmaceutical companies and drugs may not be around forever, the plants that grow in abundance in the countryside, will survive the age of oil extraction. Therefore, there is a need to record and cherish the uses of these wild plants & herbs and the value of the sources of this knowledge. There are many books and internet pages on the subject. Furthermore, Margaret Palmer, a local herbalist and member of MEG has a weekly column in this newspaper, outlining alternative ways to treat ailments and stay healthy, based on herbal remedies and wild plants.